You can print your work on paper to share with people who may not have computer access or to pass out as handouts at meetings and events. You can print the quick-and-easy way with the default settings or customize the settings to fit your needs. To access the printing controls, click File and click Print. 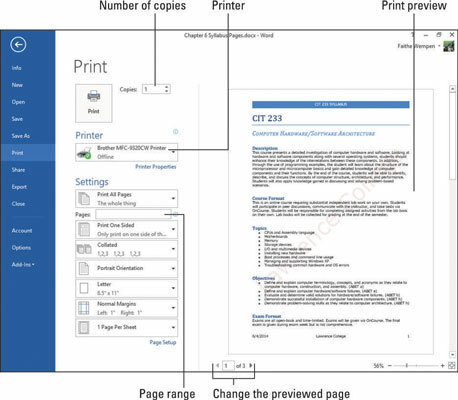 On the Print screen that appears, printing controls appear on the left and a preview of the print job appears on the right. The arrow buttons at the bottom of the screen enable you to page through the print preview if there is more than one page. Copies: One copy is the default. Enter a different number if desired. Printer: Choose which printer to use if you have more than one. Page range: In the Pages text box, you can enter the page numbers to print if you don’t want to print everything. Separate individual numbers with commas, or specify a range with a dash like this: 1-3. One-sided or two-sided: Open the Print One Sided drop-down list and choose an option. If you have a printer that only prints on one side at a time, you can use the Manually Print on Both Sides feature to print only every other page; you can reload the paper back into the printer to print the other side. Collation: If you are printing multiple copies of a multi-page document, you can choose to collate them (1, 2, 3, 1, 2, 3) or not (1, 1, 2, 2, 3, 3). Orientation: You can choose portrait (taller than it is wide) or landscape (wider than it is tall) page orientation. Margins: You can adjust the page margins — that is, the amount of blank space on each side of the paper. Pages per sheet: You can shrink down your printout to fit multiple pages on a single piece of paper.